I quickly learned that this romantic building, named the Kollegienhaus, is a structure historically significant to Berlin’s history, built over one hundred and fifty years before the side of the museum designed by Liebeskind was constructed. The architectural contrasts between these two buildings are numerous. The Kollegienhaus houses the main entrance and is immediately viewable from the outside, while much of Liebeskind’s structure is covered from street view by trees. Serving to stylistically and thematically connect these buildings is a collection of white poles covering the patio of Kollegienhaus. This is supposed to resemble a Sukkah (thatched booth), referring to the Jewish holiday of Sukkot. To access the permanent exhibition we had to go underground. This area is divided into three different axes as defined by Liebeskind. The first that we went down was Axis of the Holocaust. Walls were lined with names of infamous concentration camps. The axis grew darker and tighter as we went down until encountering a large metal door. After opening this door I entered Holocaust Tower. This room is spatially disorienting, as I was unable to exactly grasp the corners and dimensions of the room. Additionally, the space was very cold and absolutely dark except for a narrow beacon of light from some place above. The immediate sensation I felt in addition to entrapment was sorrow. What architectural ideas are transmitted in this space to give one this sensation? And furthermore, what is the space’s relation to the Holocaust, which it claims to signify? I believe the Holocaust Tower doesn’t attempt to give visitors any experience analogous to that of Holocaust victims, but utilizes innovative spatial techniques to instil sensations in visitors that force a confrontation with their discomfort. Next, we walk along the Axis of Emigration, where on the wall are names of frequent destinations for Jewish exiles. At the end is the Garden of Exile, a square with stone structures vertically high and horizontally thin, individually topped with a garden for trees to grow. ECLA students immediately compared the installation to Peter Eisenmann’s “Memorial to the Murdered Jews of Europe” in Mitte. Eisenmann’s work, however, quickly connotes human graves, while Liebeskind’s maintains a more ambiguous position and effect on visitors. Leaving these axes that connote Germany’s negative relation to Jews, we begin upward on the Axis of Continuity. This leads to a long flight of stairs that connected me to the most powerful installation in the museum, Menashe Kadishman’s “Shalechet” or Fallen Leaves. A void in the ground is covered by 10,000 metal faces that represent lives lost not just to the Holocaust, but also victims of violence and war in Germany. I decide to lightly walk down the path that these faces constitute and realize I must confront the noise I am enacting with my steps. The sound is analogous to what is heard in an ironsmith’s workshop. I glare at the faces that form the floor and see that some are smiling, others frowning, while others appear to cry. Closing the Axis of Continuity and topping the museum as a whole is a permanent exhibition of two thousand years of Jewish-German history. This exhibition stands in large contrast to architecture and installations that define the rest of the museum. The latter is ambiguous, unusual, unsettling, and focuses on the visitor receiving a particular experience rather than information; while the exhibition welcomes the visitor to a casual spectator-object relation, contains an abundance of information, and is designed not to impose on the senses. If the voids located in many parts of the museum are supposed to signify the unrepresentable nature of loss experienced in the Holocaust and other violent manifestations of anti-Semitism initiated in Germany, then it begs the question whether the traditional museum is the best way of memorializing a people or the most appropriate means of collective mourning. While noticing this odd juxtaposition, I enjoyed the materials presented in the permanent exhibition. Notable is an area devoted to Jewish women in early modern Europe, an extensive section on Moses Mendelssohn, and a room containing interviews with Jewish people in Germany asked to reflect on their experiences and identity. Especially profound was how they spoke of positive relations with other German-minority groups such as Muslims and Turkish peoples. 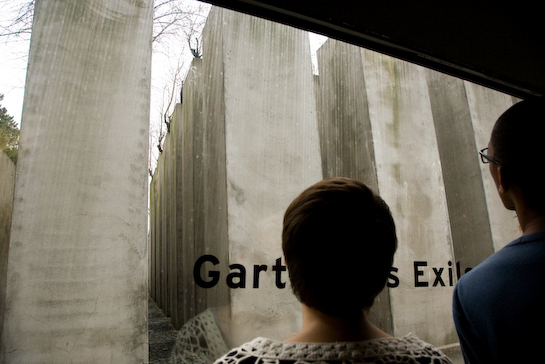 This museum in Berlin has certainly left an impression in memorializing and recognizing a people. I departed from the Kollegienhaus carrying with me the sense of having had a profound experience.